Paul Revere then sent message to whom it is believed to be Mr. Robert Newman, the sexton of Christs Church in Boston’s North End- a sexton is a person who takes care of the church, rings the bells, after working their way up from grave digger. Anyway, Revere instructed the sexton to show two lanterns as a signal in case Paul Revere was unable to leave town. The Lanterns meant the troops planned to row across the Charles River to Cambridge rather than to march out by Boston Neck - You may recall the poem, one if by land - two if by sea. Inside the house, John Hancock was still up and awake and recognized Paul’s voice and called him inside for a rest and a bite to eat. Now, there is a little more to the ride of Paul Revere, but I only wanted to slightly refresh your memory. If you recall, I mentioned at the beginning that this was a story about a midnight ride to warn patriots of British troops marching into town. But, there was perhaps a more notable but less known, but it is certainly an interesting story. If you know this story, then you know I am speaking of 16 year old Sybil Ludington. Lets jump forward now 2 years after Paul Revers ride and head from Boston to Duchess County New York. It’s evening and Colonel Henry Ludington, a father of 12 children and commander of the Duchess County militia receives a message at his house. It seems the British are just across the state line in Danbury Connecticut where they had found American military stores, stolen some and destroyed the rest, all while enjoying some American Whiskey, which they had stolen as well. Of course, Colonel Ludington’s 400 men were all on furlough (I don’t think because the government had shut down, but we can talk about that in a future post). 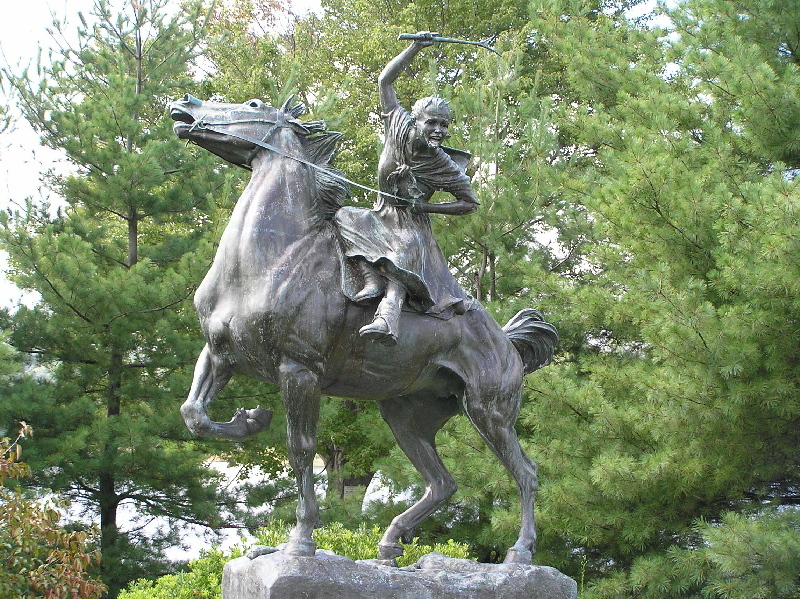 We aren’t sure whether the Colonel asked his daughter or she volunteered, but either way, 16 year old Sybil Ludington rode nearly 40 miles (twice the distance of Paul Revere’s ride) to raise the 400 militia men, and fighting off a highway man on the way with the musket her father had given her. The militia didn’t make it in time to stop the British attack, but the militia did manage to beat them back and the British paid dearly with lives. Sybil received gratitude from both George Washington and Alexander Hamilton for her bravery. In 1784, a year after America achieved its independence Sybil married Edmond Ogden and they had one son, Henry - named after her father. Sybil died at the age of 77 of February 26, 1839. "One who even now rides from Carmel to Cold Spring will find rugged and dangerous roads, with lonely stretches. Imagination only can picture what it was a century and a quarter ago, on a dark night, with reckless bands of "Cowboys" and "Skinners" abroad in the land. But the child performed her task, clinging to a man's saddle, and guiding her steed with only a hempen halter, as she rode through the night, bearing the news of the sack of Danbury. There is no extravagance in comparing her ride with that of Paul Revere and its midnight message. Nor was her errand less efficient than his. By daybreak, thanks to her daring, nearly the whole regiment was mustered before her father's house at Fredericksburgh." And today, on the shore of Lake Glenida in Carmel, New York, There stands a bronze statue of a young woman on her horse Star that was dedicated in 1961. Here Sybil Ludington is remembered for bravery shown in service to a young nation fighting for independence and freedom from tyranny. I brought this short story to you today because I believe it is important to know that not every national hero has a monument in Washington DC or a prominent place in our high school history books. This young woman rode twice as far in less time, and (unlike Paul Revere) managed to not get captured, but she has gained limited notoriety. But this podcast isn’t about what is fair, I bring these stories to you to illustrate how anyone can play a part in the future of a Nation. Even though the road may be dark and frightening when we work for a greater purpose and the love of a Nation we can do great things. It is stories like Sybil Ludington’s that keep me digging through the annals to bring you more Uncovered History.